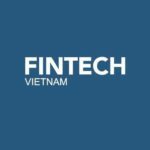 Earlier this month, bankers and fintech experts gathered in Vietnam to discuss the future of banking, the evolving payments landscape, and digitalization in the financial industry. Representatives of Deloitte, Asia Commercial Bank, Saigon Commercial Bank, Oracle, Fintechnews.sg and BankClub took part in two events organized in Hanoi and Ho Chi Minh City in Vietnam by American multinational computer technology firm Oracle during which they covered topics such as the Vietnam banking landscape, open banking, digital banking and payments innovation. 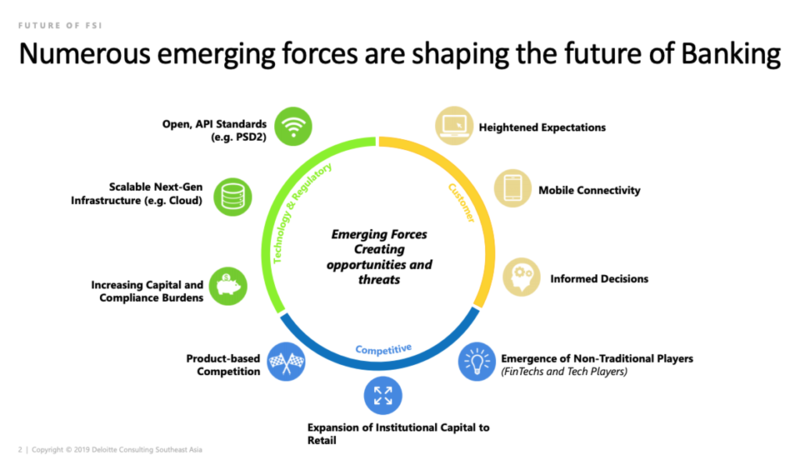 Gaurav Goel, director of Deloitte, presented the numerous emerging forces shaping the future of banking, which include open banking and API standards, scalable next-generation infrastructures, increasing capital and compliance burdens, the emergence of non-traditional players including fintechs and tech players, and mobile connectivity. 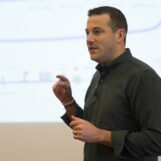 He explored how banks including BBVA and DBS have responded to the changing banking landscape. BBVA has utilized an array of initiatives to create new opportunities in both new and existing markets and acquired pure digital bank Simple in 2014. 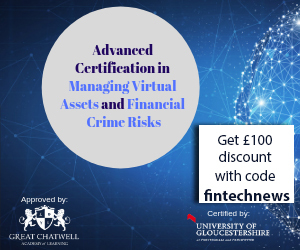 It also offers services such as BBVA Contigo, a remote account management service, and BBVA Soluciones, which provides financial and non-financial services to small and medium-sized enterprises (SMEs) including HR payroll outsourcing and customer relationship management (CRM). 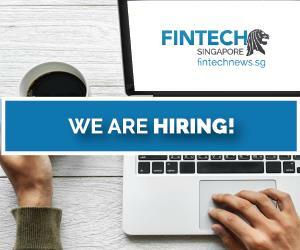 Meanwhile, DBS has been focusing on creating a platform bank to solve daily and life needs. The bank’s strategy is to make “banking invisible” and seamlessly integrated into customers’ lives. It has inked several ecosystem partnerships and developed data analytics and API capabilities as part of the plan. 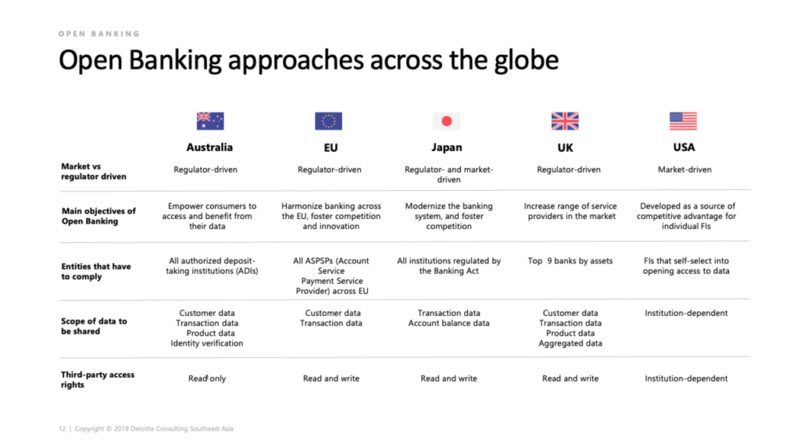 Goel addressed how open banking is gaining support across the globe, and how the trend will create new ways for customer interacting with banks. He also mentioned the changing cross-border payments landscape, citing initiatives such as SWIFT’s GPI, an industry collaboration connecting more than 250 banks to improve the speed, transparency and traceability of payments, and central bank issued digital currency (CBDC), a tokenized form of a central bank issued currency leveraging distributed ledger technology (DLT) that’s gained popularity around the world in the past years. Claude Spiese, founder of BankClub and CEO of Link Development, shared his experience launching Timo, one of Vietnam’s first and most successful digital banking platform, and brought first-hand advice on how to build a digital bank and business. Spiese built and launched Timo in 2016 and ran the company before joining the board of directors and focusing on regional expansion. In 2018, he developed a new concept digital bank called BankClub. 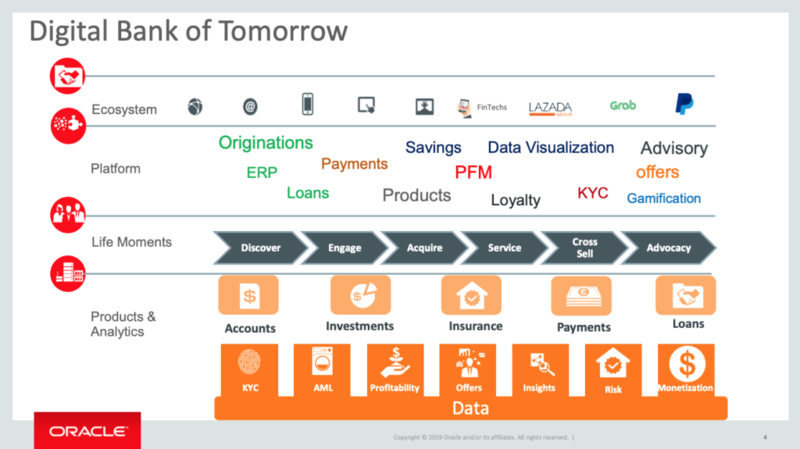 Faisal Khan, banking solutions director of Oracle Financial Services, described the digital banks of tomorrow and explored how open banking APIs can be used to build a truly digital financial services ecosystem. The digital bank of tomorrow will offer frictionless originations over digital channels, superior user experience across channels, leverage artificial intelligence (AI) capabilities for instant service and payments, participate in open banking, and provide deeper engagement by offering value added services, he said. Khan cited the examples of UBank, which pioneered five-minute customer on-boarding and account opening process with superior customer experience as a sustainable differentiator, Airtel Payments Bank, which allows consumers to open savings accounts in less than three minutes leveraging on captive telco customer base, and Suncorp, which offers digital personal unsecured loan disbursement within eleven minutes in a bank account. Mr. Huan, vice CEO and CIO of Saigon Commercial Bank (SCB), presented a development strategy for banks to move to a “digital core” and boost customer value. Huan highlighted the need to use technology to optimize business operations as well as the need to provide a digital banking offering, bringing traditional financial services products to the digital era and attracting customers. He also presented SBC future plans in terms of digitalization, including the deployment of open banking, peer-to-peer payments via social media platforms, mobile wallets, QR code mobile payments, and more. 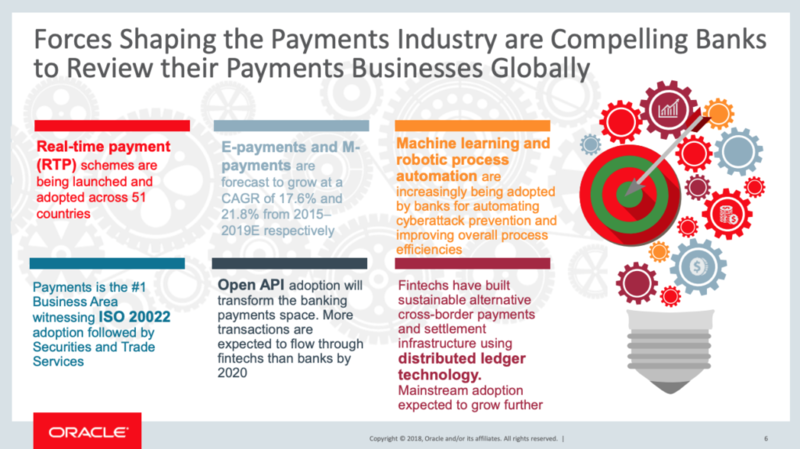 Anand Ramachandran, senior director of global banking solutions practice at Oracle Financial Services, addressed the need for banks to embrace payments transformation to gain competitive advantage and boost revenue. He detailed the case of Vietnam where the government has set out to dramatically reduce cash transactions and improve electronic payment methods. He noted that digital transactions have significantly grown in the past years, demanding banks to rethink their offerings. 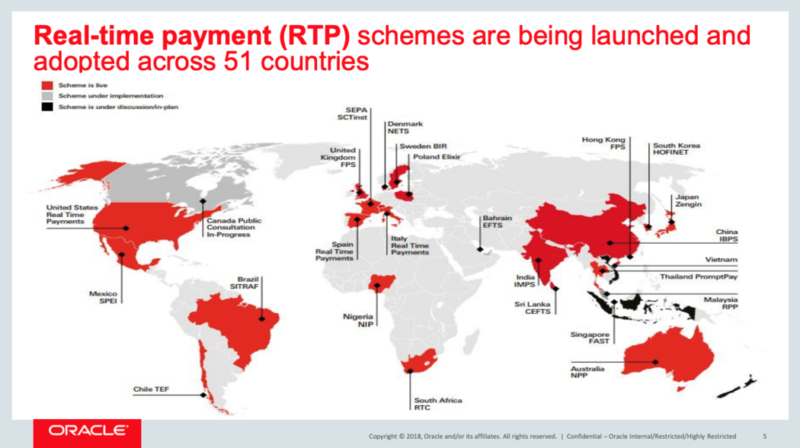 Besides Vietnam, a lot of countries around the world have launched or looking to launch real-time payment. 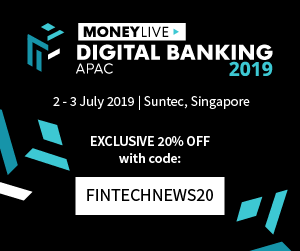 But alongside real-time payments, other forces are also shaping the payments industry including the anticipated growth of digital payments and mobile payments, open APIs, blockchain technology and machine learning and robotic process automation, Ramachandran said. Matthew Martin, former chief information officer of Asia Commercial Bank, presented the corporate payments landscape and explained why Vietnamese banks must prepare themselves to the new rules of payments innovation and transaction banking. Matthew said “Vietnamese Banks have lost the retail game already, they should focus now on corporate banking”, they can lose much more here then in retails. Corporates are facing many challenges, including rising regulatory costs, outdated non-digital methods, lack of visibility of payment flow, as well as mismatch between real and corporate payments, he said. But many developments are being made in areas such as mobile payments, access to international markets, 24×7 payment tracking, e-invoicing, automated cash management, APIs and open banking. Martin urged banks to begin digitalization themselves, citing the changing regulatory landscape with rules such as PSD2, rising payments fraud and cybercrime, and the broader fintech trend which has been pushing banks around the world to go digital.